More than fifty types of designs were used for national currency, and we buy all of them. Click the orange link above to learn more about national currency. 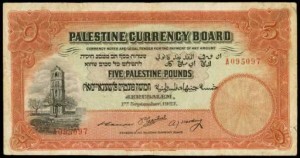 Obsolete banknotes can be worth anywhere from $10 to $10,000. The value is based on the condition, denomination, and bank of issue. These are a specialty of ours. 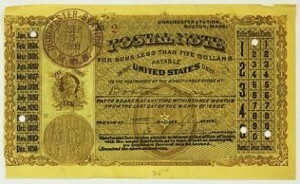 1863 marked the first year that gold certificates were issued. They were last printed in 1928. Today they are all very collectible. You can learn more about gold certificates by clicking the orange link above. Most silver certificates are fairly common, especially modern small size silver notes from 1928 and newer. Some silver certificates from the 19th century can be rare. Click the link above or the picture below to learn more about silver certificates. Legal tenders are also simply called United States notes. Most of them have red seals. However, that is certainly not a rule. We are aggressive buyers of legal tenders, especially 1869 and 1901 examples. Lots of old United States money has the term “Treasury Note” printed on it. However, the collector term only refers to coin notes from 1890 or 1891, some of which are very rare. Federal Reserve notes come as three distinct types. 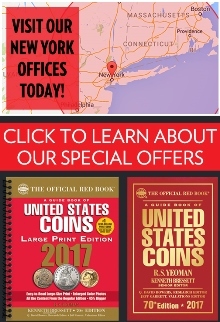 The most valuable notes are almost always 1914 red seals. These were issued for a very short period of time. Fifties and one hundreds are always popular. Unless the serial number of your 1914 blue seal federal reserve note ends with a star symbol, then it will be very common. These are still collectible, so don’t completely dismiss them. We purchase all five hundred dollar bills. We are especially looking for notes with serial numbers under 100 or star notes. Anything from 1928 is a bonus. High grade $500 bills are especially in demand right now. Grover Cleveland is featured on the $1000 bill. These high denomination notes are usually available for around $1,500. However, things like the condition and serial number can increase the value. Large size federal reserve bank notes were issued for 1915 and 1918. The year 1914 is also written on some of them. We are aggressive buyers of this type of money. 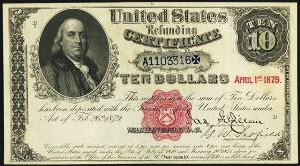 Demand notes are the earliest type of paper money issued by The United States. Demand notes are rarely found in high grades. We collect all denominations. Please offer anything you have available. These are rare and unusual bank notes that you don’t see every day. 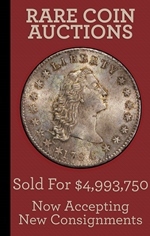 Some can be worth thousands of dollars in high grades. Most Hawaii notes are extremely common and worth less than $50. However, we are looking to buy stars, low serial number, and consecutive runs. Click the orange link above to learn more about Hawaii notes. Anything with a yellow seal and a blue overprint is known as a North Africa note. These are very similar to Hawaii notes. Most are common but we do buy special examples like star notes, low serial numbers, and consecutive runs. These aren’t really paper money. However, we still pursue them. We are especially looking for golden examples from 1883 and 1884. These are very scarce but not especially popular in today’s market. 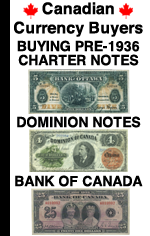 We buy bank notes from The Bahamas, Barbados, Bermuda, British Guiana, British Honduras, Canada, Grenada, Hawaii, Jamaica, Hong Kong, The Leeward Islands, Palestine, The Philippines, St. Lucia, Trinidad and Tobago, Turks and Caicos, and Zanzibar. If you have other types of money then we would suggest that you send us pictures of them. We can’t help you value any foreign currency over the phone. 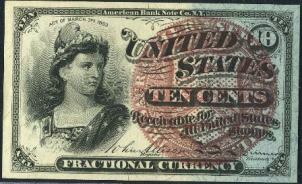 Most fractional currency is fairly common. However, there are some rare varieties out there. Send us pictures of what you have and we can check to see if you have some rare. Most MPCs are worth a couple dollars each. 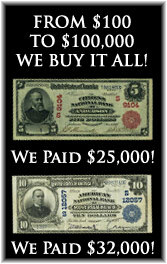 We are looking to buy higher denominations, high grade notes, and replacements. Contact us if you think you have something of interest.